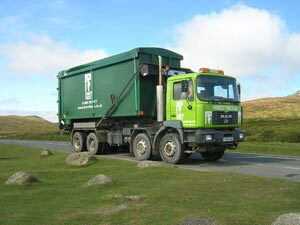 Pellets can be delivered in bags of various sizes up to one tonne dumpy bags. One tonne bags are delivered on a pallet and are perhaps the most versatile way of getting pellets as they can be stored in almost any dry space. But buying in wood pellets in bags is potentially more expensive than buying in bulk. Wood pellet truck. Photo: Forest Fuels Ltd.
Pellets can also come by truck where they are tipped out from the truck or blown through a tube into a wood pellet store. Often these wood pellets can only be ordered at a minimum quantity but it works out cheaper. You have to have a dedicated pellet store which can be either inside or outside your house. Wood pellet stores can now come off the shelf as it were or be custom made to your requirements but you can also opt to build your own pellet store. 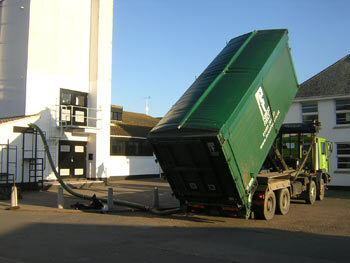 Wood pellet blown delivery - an easy way of filling your pellet store. The bulk pellet delivery truck has a long hose so that it can blow the pellets into the store from a decent distance if needed. Your wood pellet boiler stove would then be fed from the pellets in the store via an auger or vacuum delivery system.